All gifts are wrapped. Menus and holidays have been thoroughly planed. You’re all good on the food shopping front. Yet, you feel like something is missing, the dot on the i. And I you – obviously – have too much time on your hands. Within minutes the squeaky clean kitchen is turned into a state of pure mess, “Granola would make a nice little gift add-on” you thought. And here is more thinking, “How about a nicely packaged cube of membrillo“, you talked yourself into a moment later. Right, and as if this wouldn’t make enough xmas gift add-ons already -going xmas loco by now-, your significant better half suggests making another batch of the delicate florentines we’ve been feeding ourselves into coma this December. Done. Anyway, if you are thinking about adding a little culinary add-on to your gifts, these are a fantastic quick fix. Preheat the oven to 200°C (~390°Fahrenheit). Line two baking trays with parchment paper or baking mats. Melt heavy cream, honey, sugar, vanilla sugar and butter in a pan, then let simmer gently for at least 5 minutes over medium heat. 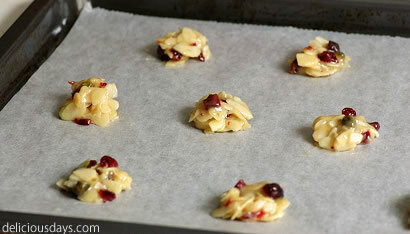 Meanwhile finely chop the dried cranberries (or other dried fruits). 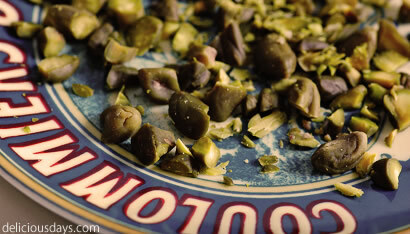 Remove the hot cream-sugar mix from the stove and stir in the fruits as well as slivered almonds and chopped pistachios. Finally, add as much sieved flour as necessary until the mix gets pretty firm, yet the nuts should stay whole (mostly). Place little heaps of the mix on the baking trays and leave plenty of space in between – these cookies spread enormously. 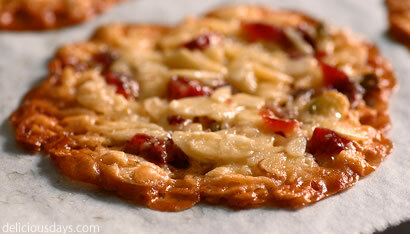 If you prefer your florentines rather soft, leave them as are, the almonds in the center won’t take on much color and will stay chewy, while the edges will caramelize. If you prefer your florentines thin and crisp, you should flatten them carefully with wet fingers or the back of a greased spoon, so they can brown and spread more evenly. I recommend seeing the first tray as a kind of test run, afterwards you can better evaluate, how much the dough spreads and which variation you like best. Bake on middle level for 8 to 10 minutes or until the cookies have reached the desired golden brown color. Make sure, that they don’t burn around the edges! Remove from the oven and pull the parchment paper onto a cold baking try (don’t burn yourself! ), then let cool off completely. Store in an airtight container (use parchment paper or similar to keep the layers separate, otherwise they will stick together easily), they taste best within the first week. Optional: Slowly melt the chocolate couverture over a bain-marie while continuously stirring and dip the bottom in the chocolate or brush with a pastry brush. Let drip off excessive chocolate and let dry on parchment paper upside down. A wonderful christmas to you Nicky! Allen Lesern und dir Nicole wunderschoene Feiertage und tausend Dank fuer die tollen Beitraege hier. Those look so yummy! The remind me a little of lace cookies. I bet they would be nice with a little zested orange, too! Your discription of preparing last minute Addons sounds like me :-D Florentiens are a nice Idea! Merry Christmas Nicky! 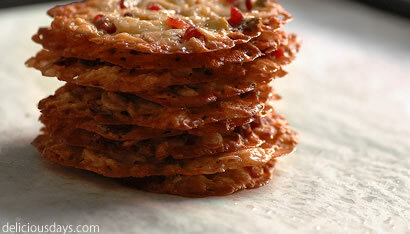 The florentines look so good! These remind me of lace cookies... those are my favorite. They spread like this and are chewy and buttery at once. Oh wow. Those look amazing! :D Crispy lilttle muchies that I would love to have at work right now! Mine look like lace - maybe not enough almonds(only 100 g), maybe I spoilt the substitution of heavy cream (2/3 cream/crème fraiche, 1/3 butter). I am soooo making this for Christmas this year! Yumm! I just took my first patch out of the oven. They are so delicious! Definitely a keeper. 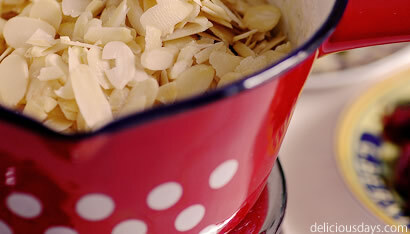 I adapted them to be gluten-free using a flour mix containing brown rice flour, tapioca starch and potatoe starch. It worked out perfectly. this is my second season baking with your recipes, and all things came out just wonderful. Thank you so much for all of the wonderful recipes and pictures to go along with them. Mele Kalikimaka as we say in Hawaii, Merry Christmas 2010.